Set on the beautiful beach of Ixia, the charming Amathus Beach hotel is a peaceful sanctuary for tranquil escapes offering sweeping uninterrupted views to the dazzling Aegean. Exuding an aura of calm this waterfront family beach hotel in Rhodes Island offers the most idyllic venue for family holidays. The Archontiko Angelou Traditional Hotel is a neoclassical two storey building dating back to 1895. "Hidden" in a private estate, it offers an onobstructed view in all directions and is located near the beach of Alinda. It offers 9 rooms and can accommodate up to 22 guests. Following renovation,the mansion maintains its original layout, with the exception of the addition of baths. Open from May to October. During the rest of the year, long term rental is possible. Working period: April - October. The 250 luxury guestrooms and over 60 private use pools offered by this luxury 5 star hotel in Rhodes feature pleasure-seeking details. A fusion of design, decor and innovation along with the legacy of Greek hospitality deliver treasured holiday moments. Blue Sky Beach hotel is located right by the beach, on the western part of the town of Rhodes, at a short distance from the center. It is open from April to November and offers 179 rooms equipped with bath, A/C, TV, telephone, mini-bar, safe-box, hairdryer and verandas with a lovely view of the sea. The hotel offers spa facilities. Chrissoula Hotel Complex is located in the Alinda region of Leros island, 4km (2.5miles) from the airport, 4km from Platanos, 450m (1476ft) from Alinda beach, 400m (1312ft) from Panagies beach and 550m (1804ft) from the bus stop. The hotel features parking area, swimming pool, pool bar, fitness centre, children's playground, TV room and café. All bungalows feature air-conditioning and lovely sea view. At Elysium Resort & Spa you will be thrilled with the 5 star leisure facilities that are available to keep you de-stressed and let you relax in Rhodes throughout your stay! Discover an oasis of luxury accommodation in Rhodes where pure elegance is combined with the highest of standards and in-room comfort nowhere else to be found on the island. Galaxias Hotel is a small, cosy and elegant hotel in a comercial street in Rhodes town. Galaxias hotel is located at a focal point of the city, with easy parking around. In just 10 minutes walk from the medieval city and just 15 minutes walk from the ancient Acropolis. At Galaxias hotel, with emphasis on simplicity, comfort, cleanness, and quality, we provide a pleasant and decent stay, with love and care, in a warm and elegant environment, at very affordable rates. 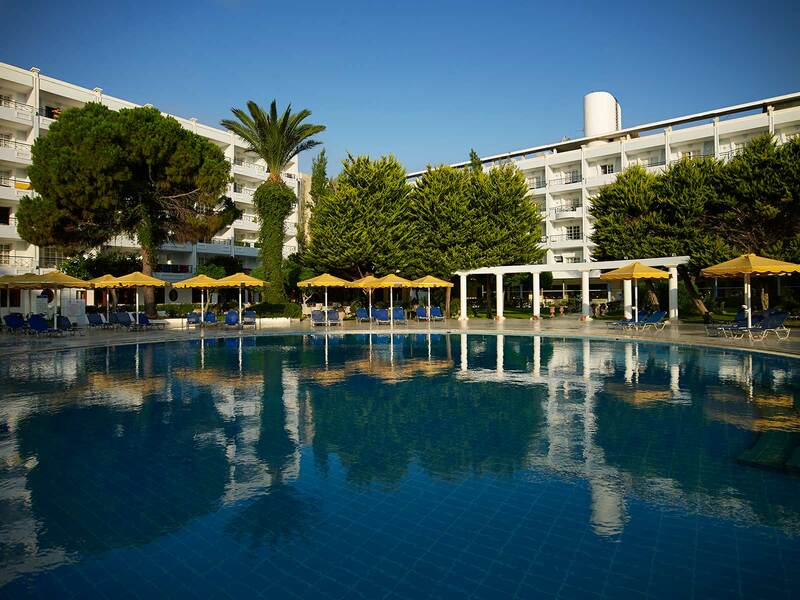 Mitsis Grand Hotel is Rhodes' first premier, five star luxury hotel, located on the cosmopolitan island of the sun and surrounded by the crystal waters of the Aegean Sea. Centrally situated in the city of Rhodes, the fully renovated hotel is just a few minutes away from the main historical and cultural attractions. The complex overlooks a sandy beach of the beautiful Aegean Sea. Island Blue Hotel offers two pools, Almira and Elia, and a couple of accompanying bars. Comfortable family accommodation is at its best at Island Blue Hotel: there is also a children's pool, a playroom, a playground and a kids club at the adjacent hotel, Lindia Thalassa. This infrastructure aims at making sure that everybody - no matter their age - is cared for. "Kalderimi Studios" is located just a few metres from the beautiful port, on the way to Patmos Town. It offers its guests 5 studios and apartments with an excellent view. On one side the monastery and Patmos Town and on the other the picturesque Skala harbour. All the studios and apartments are decorated with the traditional style and character of the island. Each unit features a fully equipped kitchen, bathroom, A/C, TV, telephone, safe-box and hairdryer. Located at Faliraki, just 100 meters from the sandy beach, Kouros Exclusive features a pool with a poolside snack bar and a large terrace. it offers accommodation with private balconies overlooking the Aegean Sea or gardens. Kouros Exclusive Rooms & Suites are bright and air conditioned each with a coffee maker, fridge and free Wi-Fi access.